The London-based publication is for, and about, stylish women who love soccer. Ball is life in North America, but football is life in the U.K. The Premier League, Britain’s best-known, multi-billion dollar men’s football professional association, counts 20 active clubs — five of them in London alone. But just like the NBA and NFL in North America, women have been largely absent from the fandom narrative. 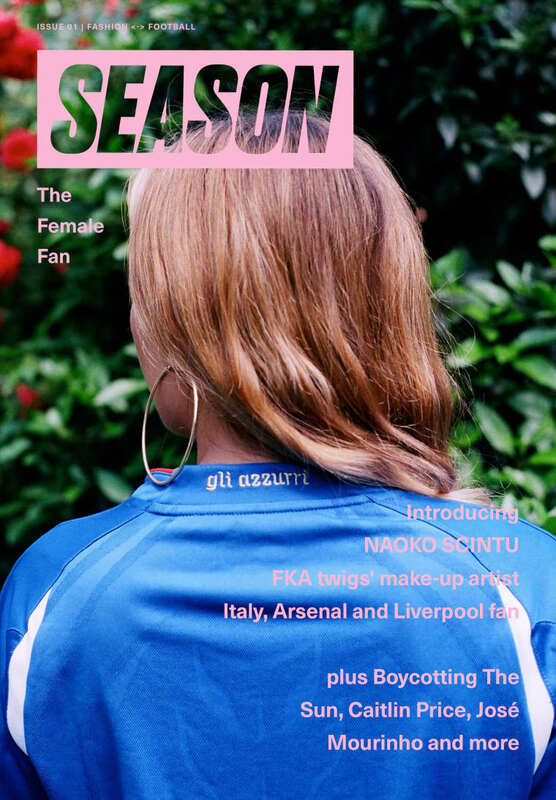 SEASON is a new football fanzine with the substance and heft of a bespoke style magazine and it situates women footie supporters firmly within the culture. The FADER spoke with Pennant about team gear, women sports fans, and why football and fashion makes total sense. 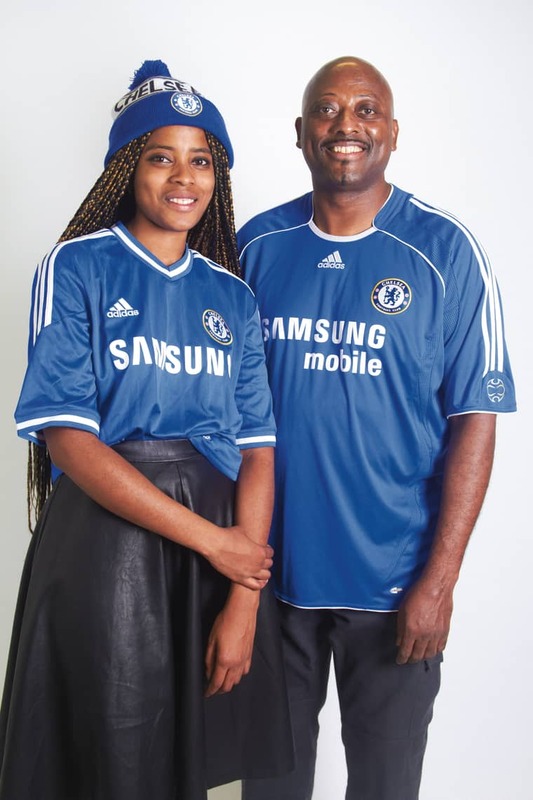 What passion came first: football or fashion? I got into football in 2004 when I was 12, during the Euro Cup. Greece won against Portugal, which was a huge shock because Portugal were the hosts, and I just remember seeing Cristiano Ronaldo crying! And I was like, Why is this dude crying?! This is so unimportant! But that got me thinking about how football can stir emotions in people. It was also a bonding thing with my dad. I live in Southwest London so my dad’s a Chelsea FC fan, and that [same] summer José Mourinho came to the club — he’s this very charismatic person. Then Chelsea started winning. I’m lucky that my interest in football coincided with Chelsea’s best period; they’ve won so much in the last 10 to 12 years. And about a year or so after I got into football, my dad gave me Vogue. How did you connect your two interests? I found this great book called The Fashion Of Football by Paolo Hewitt, that charts football and fashion from the 1960s to the early noughties, from George Best to David Beckham and what happened in between. So I tried to make my thesis at Central Saint Martins from that, and it ended up being about metrosexuality, fashion shoots, and club suits. I spent a lot of time at GQ in London looking through the Condé Nast archive and at the British Library. I love researching. I laid it out as a magazine because Fantastic Man did a David Beckham shoot in a pie shop, I think, in 2012. So all of this great football content kind of came together, but there were no girls in any of it; there was no female perspective, or voice. So I came up with the idea for SEASON in my third year connected to all of this work. 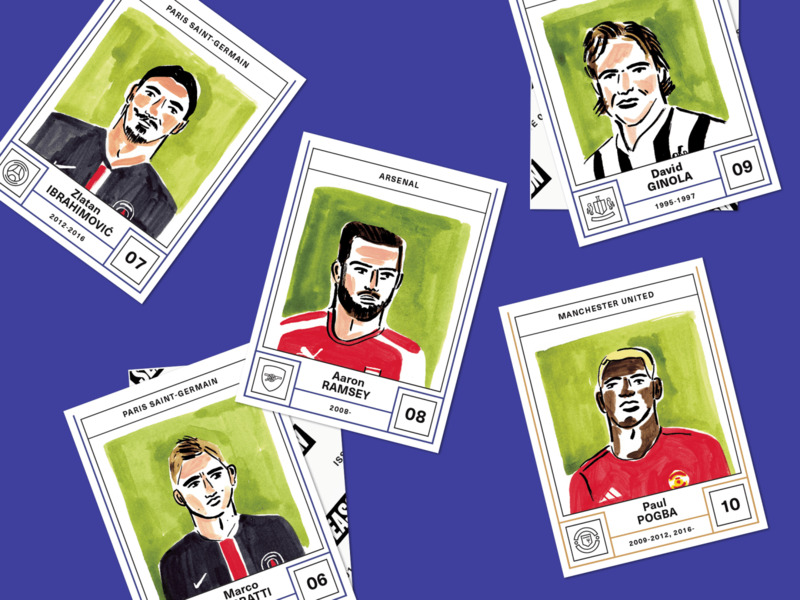 There’s a very rich history of football fanzines and sticker collecting; so I wanted to take that approach of sharing fan ideas and stories, but doing it in a fashion editorial way because that’s my background. Do you think women have a significant presence in mainstream football media today? You’re seeing a lot more pundits and women speaking about football. There’s Amy Lawrence who is a football writer [for The Guardian and The Observer]; she’s a massive Arsenal fan and really great to read. I love Talksport, and they have Georgie Bingham on Saturday mornings; she does the breakfast show. Then you have Sport which is a free magazine in London and one of their editors is a woman named Sarah Shephard. On TV, on the BBC you have Gabby Logan and Jacqui Oatley. There are more women in positions of influence [on the club side] too, like Karren Brady, who is an executive at West Ham United FC. But in terms of the culture, there isn’t really much that focuses on female fans. It’s getting better now, but when you see a beer advert it’s usually men sitting around! It’s either sexist, or it ignores women completely. Yeah! Like mums taking their kids to matches — soccer mums! I think football touches everyone; it’s universal, it breaks through gender, race, sexuality. The Premier League stat is that one in four people that attend matches is a woman. There’s more visibility in terms of pundits, but not in the culture. And when you talk about fashion in football, people bring up The Casuals [from the ’60s], and the ’90s Oasis look, but there were definitely girls into football there as well — you just don’t see or hear about them. And it’s still invisible at the moment. People see the word 'zine' and think lo-fi, cut-and-paste, but SEASON is quite beautifully designed. This is still DIY but rather than cutting-and-pasting we wanted to do something that was very much a beautiful object. Especially now that everything is online. It’s obviously cheaper to do this as a blog, but we wanted something more considered. Every single thing about SEASON has been carefully designed and thought about. I work with this incredible graphic designer, Natalie Doto, and we spend time looking at football typography — even say from the backs of shirts. And we personally prefer magazines that are more minimal like The Gentlewoman or Fantastic Man, where they’re playing with type but it’s not too busy. So that’s what we had in mind, but it’s also match day program-size, with stickers you can stick throughout; so there’s that interactive, fanzine element too. I personally wear men’s shirts; I don’t like ladies’ shirts. But then the story went even further with people saying that the newest shirts are ugly! So then the fit is irrelevant. People would much rather wear a football scarf or a hat. And people love the vintage ’80s and ’90s shirts. We have all this technological innovation for garments so why do people prefer the old shirts? I do acknowledge that it’s probably very hard to design a football shirt. You have to use the same colors, the badge, the sponsor, there are all these details and regulations you have to fit into. 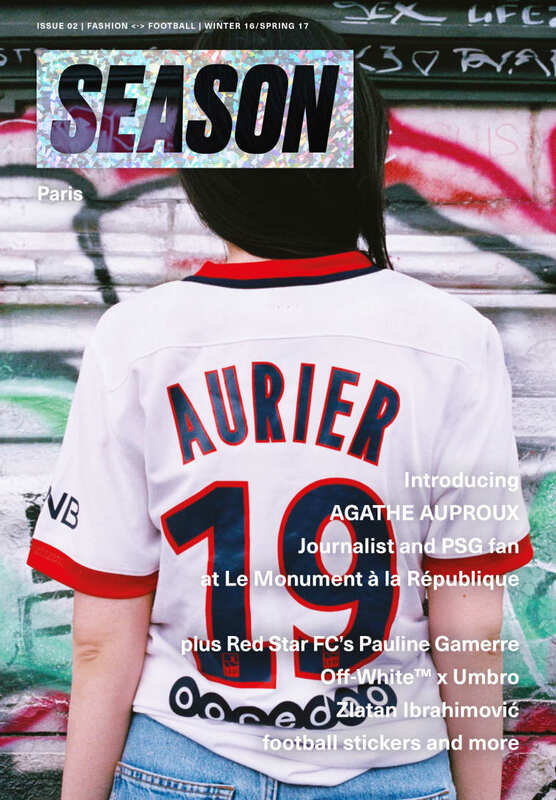 In the second issue you did stories on the French designer Andrea Crews and Off/White’s collaboration with Umbro; has there been a resurgence in high fashion brands looking to football for inspiration, or do you see football as firmly entrenched in that world? 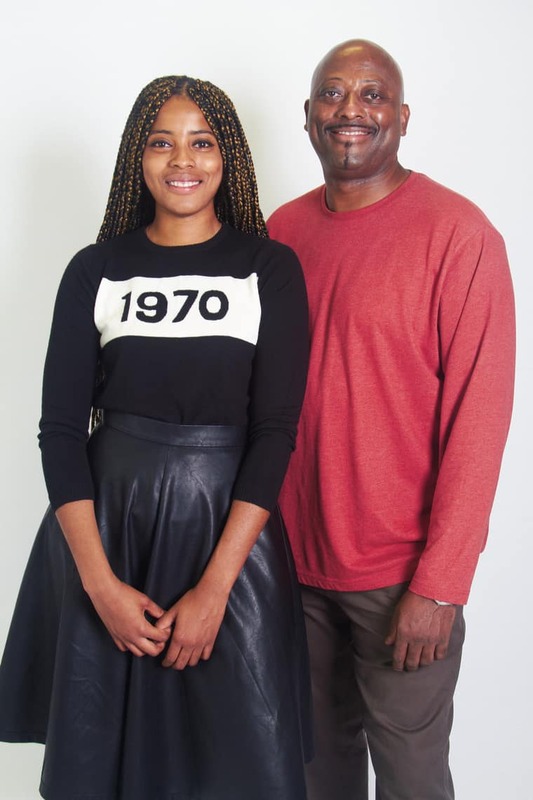 Well, I think the rise of athleisure and street style — this searching for authenticity in fashion — is indicative of fashion being more a lifestyle now. So why not remake a football scarf? Every season there are hidden football references on the runway. Louis Vuitton’s 2017 resort collection has Pelé prints on it by a Brazilian artist [Aldemir Martins]. In the SS17 collections there were a few football references; Stella Jean showed in Milan and her collection had been inspired by a football jersey. Every now and then Dolce & Gabbana put some opulent, jeweled football jerseys in their collection. And, obviously it’s menswear, but these designers also work with clubs: Lanvin designed Arsenal’s club suits a few seasons back. Dolce & Gabbana, Armani, and Hugo Boss have designed club suits and they sponsor players too. And then there are ad campaigns; [Swedish footballer] Freddie Ljungberg did the Calvin Klein ad in 2005, and James Rodriguez who plays for Real Madrid just did one too. Footballers model all the time, and fair enough, they’re in peak physical condition! There are lots of crossovers; high fashion embraced that early because these stars can afford the clothes themselves, but also because they’re aspirational and influential. Fans around the world copy what they do. Culturally, but also monetarily, it makes sense.